We have received countless emails and messages on social media about our decision to close our door. It is unusual for a restaurant with such great food and service reviews to suddenly leave the stage, especially considering the growth in our social media presence and event calendar. Our decision came after carefully considering our purpose and our trajectory. We were founded on two guiding principles. Principle One: Nigerian cuisine can be the basis of a contemporary dining experience. In centering Nigerian cuisine, we also intended to share culture. They say those who share their food with you share their heart. We intended to do just that, in a space that spoke to the sophistication of Nigerian culture. Principle Two: Nigerian cuisine is under-explored and appreciated. We chose to focus on pre-colonial cooking techniques as part of a back to basics, clean cooking model. We also wanted to explore the technical aspects of Nigerian cooking and experiment with ingredients found natively in Nigeria. While we made great strides in a small kitchen in Rogers Park, we soon realized where we wanted to go would require being closer to the source of ingredients. In effect taking a different step, one towards raising the profile and reverence for Nigerian cuisine so that it can be permitted to expand rather than remaining a museum of the past. A move towards a location more sustainable for the long term growth of this revolutionary concept. Nigerian cuisine, like West African cuisine in general, is known for its richness and variety. Many different spices, herbs and flavorings are used in conjunction with palm oil or groundnut oil to create deeply flavored sauces and soups often made very hot with chili peppers. Nigerian feasts are colorful and lavish, while aromatic market and roadside snacks cooked on barbecues or fried in oil are plentiful and varied. As is one of the world's most ethnically diverse countries, it is difficult to assign a proper national dish. Nigeria has two major seasons- the tropical Rainy Season and The dry Harmattan Season. Various and Numerous foods are grown depending on these seasons. A large part of Nigeria lies in the tropics, where many fruits are also available. Here is a little sampling of some of the numerous and amazing herbs, plants, tubers, fruits and various exotic awesomeness we use in our cuisine. Tiger Nuts – this ancient superfood originates from Africa. Tigernuts have been known at one time or another as: zulu nut, aya, yellow grass nut, ground almond, and rush nut. Despite all of these referents, what might surprise people most is that this superfood is not a nut at all. 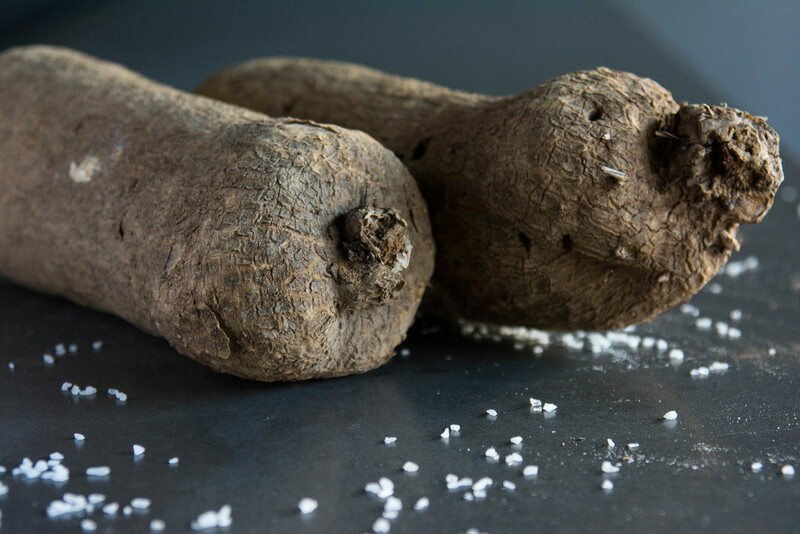 It is a small root vegetable with a sweet, nutty, flavor. They can be eaten raw, ground into flour, or squeezed to release healthy oils that are good for the heart. Even two million years ago, tigernuts were the ultimate super- food, comprising up to 80% of the Paleo diet. Fonio is Africa’s oldest cereal. It is rich in amino acids and is said to be the most nutritious of all Earth’s grains. Its seeds are also rich in methionine and cysteine that are vital to human health, which are deficient in today's major cereals. Fonio also has somewhat of a spiritual aspect to it as well. The Dogon People of Mali think that the entire universe was made by the explosion of a single grain of fonio. Ókro or Okra is a shrub with yellow flower and succulent seedpod emanating from the flower. The leaves and the seedpod are major ingredients in several local dishes across West African countries. Ókro also known as Gumbo, Bhindi or Lady's fingers is a versatile vegetable found around the world. It is often used for making soups, stews and sauces, but can also be eaten raw as a snack. In Nigeria, it is used for the popular Ókro soup and Ógbono- Ókro mixed soup. ÓGBONO is the seed of the African wild mango (Oro). The seed is dried and then milled with some crayfish in order to make Ógbono soup powder. It is also ground and used as a powerful thickener for dishes, to which it also imparts an earthy flavor. Ógbono soup is popular everywhere in Nigeria. YAM is the main agricultural crop of several Nigerian tribes - Igbos, Idomas, and Tivs. It is the "staple" food of the Igbo people. Importance of the Yams to Nigerians shows in The New Yam Festival. The New Yam Festival, known as Orureshi in Owukpa in Idoma west and Ima-Ji, Iri-Ji or Iwa Ji in Igbo land is a celebration depicting the prominence of yam in the social and cultural life. It consists of feasts and Masquerade dances. Prayers and thanks are offered for the years past and the people hope for a good harvests so no famine will hit the people in the coming year. Amongst the Igbo culture it is known as the king of crops, and in the olden days was a man’s crop. CASHEW NUTS - Ever wonder where cashews come from? You might think they grow inside a shell like any other nut, but their true origins are far more bizarre. First of all, cashews are not actually nuts, but rather fruits from the cashew tree, a large evergreen tree that thrives in tropical climates. The tree produces red flowers, which in turn produce yellow and red oval structures resembling apples. These so-called cashew apples are very juicy and pulpy, and their juice is often added to tropical fruit drinks. Bitter Kola – Garcinia kola is very important to the tribes and villages in Nigeria. The fruit, seeds, nuts and bark of the plant have been used for centuries to treat ailments including coughs, fever, and impotence. Uziza Pepper is a berry from the Uziza plant that grows throughout tropical areas of Africa. The reddish-coloured berries look like cubeb pepper berries, but are smaller and more oval shaped, and have less of a bitter aftertaste than cubeb pepper. The berries are dried and then used as peppercorns are used. They have a peppery taste because they contain piperine. Egusi “Citrullus Lanatus” is a melon that looks exactly like watermelon on the outside, but completely different on the inside–with it’s bitter white flesh and seeds. The people of Nigeria and Congo call it wild watermelon, Egusi melon, or Ibara. This makes it a great source of food for farmers in even the worst conditions. Peri-Peri Pepper is also known as bird's eye, African devil, or African red devil. The exotic Peri-Peri is Africa's hottest pepper. The peppers are green when immature and bright red or purple when mature. Calabash Nutmeg - Calabash nutmeg is one of the highly-prized spices known from antiquity. For the conservative and initiated, this is one spice that is valued for its aromatic, aphrodisiac, and curative properties. To see our favorite Nigerian classics menu at New Market please click here. At Little Unicoco, We lovingly and painstakingly create every food we serve by hand as it would have been done in the halcyon days of our great fathers. The days of Okonkwo the chief protagonist in Chinua Achebe's "Things fall Apart". It is from here we catapult our creative endeavors into the present day as we re-imagine our cuisine for the palette of the current century gastronomy connoisseur... foodie warriors. It is a beginning that is at once delicate but surely footed as we journey towards a modern continental Nigerian kitchen. By taking this stance or conscious decision in our food preparation, we hereby bypass the bad cooking habits introduced to our culture during the colonial era. Such was the colonial success in seducing us that we quickly abandoned our cooking techniques developed and honed over eons in exchange for the "goodies" of the industrialized West. As Africans, we are a constantly forward looking culture and it was only natural that we adopted and "Africanized" these habits. In our kitchen, we do not use Maggi or other processed gimmicks sold to us Africans as the "future of efficient/ delicious cooking". We proudly make by hand and from scratch all our classic foods. Yes this is authentic, it is street, it is complex and full of adventure for your taste buds. Here you will taste the Old World and explore the experiments and developments of our kitchen as we re-imagine and navigate through this rich and highly developed culinary gift from a time before now. We welcome you to come dine with us!!! To see our favorite LUNCH menu at New Market please click here. New Market by Little Unicoco is an idea that combines our roots of street food together with food retail and brought forward to a diverse culture of foodies et al..... In Africa the daily market and dining is as old as time herself. Here at New Market, we serve our favorite Nigerian classics and special Lunch in a bespoke environment that is complimentary to the New Africa. Chicago has become a premier world-class foodie city. Little Unicoco restaurant is the first purpose built New Nigerian cuisine restaurant to offer an experience of authentic Nigerian cuisine. The design esthetics of Little Unicoco is modern, minimal with color tones evocative of modern Africa. We offer an excursion into the varied exotic cuisines of Nigeria, both classical and its modern evolution. Little Unicoco Restaurant is available for private and Semi-private celebrations of as small as 12 and as large as 150 persons. We have two separate dining rooms, available as combined or as separate venues. The “New Market” space is for smaller intimate private events that seats 18 for dinner or 40 for a cocktail style reception. The larger main space inclusive of a full service bar, is also available for both private and semi-private events. Both spaces are equipped with Wifi and audiovisual capabilities for professional and non-professional presentations. At Little Unicoco, We represent a new generation of Sub-Saharan African restaurants. We are a generation of Africans introducing to the world our diverse, complex and beloved cuisine. Showing the innate beauty and vibrancy of the food cherished by millions but still unfamiliar to most beyond Africa. We bring to the culinary world of global cuisine a box of goodies. We bring adventure and an unforgettable sensory experience for your palette. Event capabilities: As a festive and highly social culture, our cuisine brings exotica to a variety of events. From small Office Meetings to Weddings… Receptions, Corporate/ institutional outings and other social events. Our catering License is a full liquor license for off site catering events. We are eager to work with you to customize your needs where possible as we help realize your exacting requirements. Packages: we offer various packages ranging from, Buffet style catering, Passed hor d'oeuvres/Finger foods, Hor d'oeuvres followed by buffet, Catering plus service staff more details available upon request. How to place your orders: Our Planners are ready to customize a menu to meet your needs. All orders must be placed with a minimum requirement of 7 days in advance. Any orders placed with a shorter notice will face a $50 rush-charge. For additional information or to learn more about our catering, please contact us at info@littleunicoco.com or amy@littleunicoco.com.